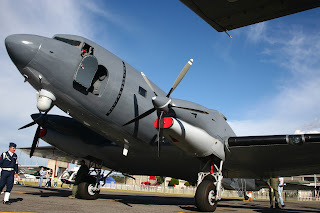 MANILA, -- US company Basler Turbo Conversions is offering its BT-64 gunship to the Philippines as that country looks for a replacement for its ageing Rockwell OV-10 Broncos, the company announced on 12 October. The BT-67 is essentially a twin-turboprop conversion of the Douglas DC-3 Dakota fitted with updated systems such as digital avionics, a night-vision goggle-compatible cockpit, weather radar, and a forward-looking infrared (FLIR) sensor. It is being offered as a multirole platform that not only performs the ground attack role of the OV-10, but can also fulfil transport, surveillance, aero medical evacuation, and maritime patrol requirements of the Philippine Air Force (PAF). According to the Basler Turbo, the BT-67 offers a flexible configuration depending on the mission, a rough-field short take-off and landing (STOL) capability, a readily accessible pool of parts and spares, and reduced vulnerability to manportable air defence systems (MANPADS) on account of the exhaust vents for the twin Pratt & Whitney Canada PT6A-67R engines being angled over the wings. The BT-67 is based on arguably the most proven airframe in the history of aviation, with the DC-3 having originally entered service in the mid-1930s. Performance specifications for the turboprop-powered Basler variant give it a more than 4,500 kg payload capacity over 650 n miles (or 1,200 kg over 1, 875 n miles with long-range tanks), and a 35 m 3 cabin volume. The aircraft has a cruising speed of 210 kt and a service ceiling of 13,000 ft. Already fielded by the air forces of Colombia (gunship), El Salvador (transport), Guatemala (transport), Mali (transport), Mauritania (surveillance), Thailand (scientific research), and by the US State Department (transport and surveillance), deliveries to the Philippines could start a year after a contract signature. The Philippines is set to re-launch its OV-10 Bronco-replacement programme, with a new request for proposals (RfP) to be issued in the coming months. The Basler BT-67 FAC F-AIr gunship is the forward looking infrared on display.